Cape Town - As long as the mining industry can see a clear game plan of the SA government for the years ahead - at least a 5-year transition plan - they can determine how to get the best out of current infrastructure and invest in the kind of infrastructure they will need for that period and beyond, Mark Cutifani, CEO of AngloAmerican, said at an event hosted by Bloomberg LP in Cape Town on Wednesday. He said in such an environment mining companies would be willing to get involved in the social responsibility side of communities even if they are not able to create direct jobs at mines. "We have continued to invest in SA and we believe in the future of the country. It has been a tough world for mining, forcing us to restructure globally," he said during a panel discussion at the "Future of South Africa" gathering. "It is a good start in making sure there is the right leadership in SA with President Cyril Ramaphosa, and this trend is filtering through further." Cutifani emphasised that infrastructure is very important for investment in the mining industry. "If we simply run what we have well, we will be ahead of the rest of Africa. 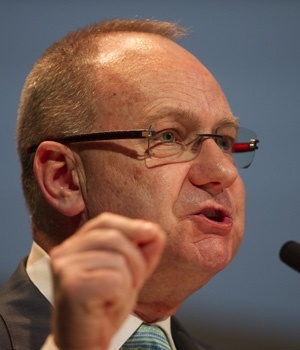 We (AngloAmerican) have doubled productivity by focusing on our clear assets where big infrastructure was effective and we ran that better," he said. "It gave us a new foundation. You have to run what you have better before you throw a whole lot of money at it." As for the Mining Charter, he said AngloAmerican spent two years working on an approach to it, "but no one wanted to listen to us". "Today we have someone to talk to," he added - but did not specify who that is. "We have to rethink how we engage workers and provide a sense of ownership. We need to provide a different framework to get everyone around the table." Magda Wierzycka, CEO at Sygnia asset management, was another member of the panel. In her opinion there is a need to get clarity on the charter, because mining creates jobs.